This month I am going to tell you about a lift that although widely used is little known. Now, that might seem a contradiction to a lot of you, yet it is so. The 'lateral raise lying' is used in some form or the other by every bodybuilder on earth, and it is never connected with record breaking or competition. It isn't recognized as a basis for establishing record lifts, or for contests in this country, although it is on of the 44 lifts in the Rule Book of the British Amateur Weightlifters Association. The movement is almost solely confined to the pectoral muscles as a 'leverage' movement and is an extremely valuable exercise when it comes to effecting increases in chest size and musculature. It is impossible to find a single weight trainer who doesn't make use of the 'flying exercise' for the pectorals or else to enlarge the rib box . . . a glance at any prominent model or bodybuilder will suffice to show that he devotes a considerable portion of his training time to exercises that give the upper chest muscles lots of work. And not only as a builder of bulk does the exercise shine. It is also used between sets of squats to induce a larger lung capacity and increase the 'stretch' of the ribs. Now I am fully aware of the present craze for 'big pecs', as some members of the bodybuilding world refer to them, and I do not hesitate to condemn this attitude. To me there is nothing more revolting than to see a bodybuilder with such disproportionate pectoral development that he looks like a candidate for a brassiere advertisement. This is all wrong. It's weight training gone haywire. Always should your trend be towards a BALANCED development with every muscular section terrific when viewed individually yet blending harmoniously with every other body section so that, as a whole, nothing is outstanding except the ENTIRE physique. To you young bodybuilders intent on working only on pectoral exercises I say this . . . "It isn't now, while you are young, that you have to worry. It's when you approach your late thirties and early forties and your enthusiasm and energy lessons. The pectoral muscles will lose their tone, will sag and look ugly and unsightly." You don't want that, I'm sure. Your aim is to retain a certain measure of development and good appearance. The more immoderately you exercise, over-concentrate on any particular muscle group, the more work that group will need once you start to neglect it. Specialization, I repeat, should only be used to bring sub-normal sections of the physique up to parity with the rest. The present tendency toward pectoral exercise is the direct outcome of the movements made possible by the use of the various forms of the exercise bench. Hundreds of bodybuilders use bench presses with barbells or dumbbells and just as many make use of the various incline bench pressing exercises. The last two years have seen a greater use of parallel bar dip and floor dips to triceps and pectoral building, as assistance movements to improve the bench press poundage, and it is small wonder that weight trainers, seeing the tremendous improvements in chest size gained as the result of using these particular pieces of apparatus, have reasoned that a more direct approach would produce even faster and bigger gains. Hence the widespread use of direct pectoral exercises, such as the bent arm lateral, or as it is called, the "flying exercise," and the actual lift itself, the Lateral Raise Lying. I have no record of what has been done in the USA. The lift is not recognized here anyway. It is strange too, that despite its widespread popularity, bodybuilders never seem to try their limits on the lift. This is because limit attempts can be quite painful or uncomfortable. There is a strain on the elbow joint and the muscle attachments become quite sore. The way to overcome this is to start in gradually with the exercise, using light weights at first and and steadily building up the poundage. Don't attempt to make your increases in either reps or poundage too rapidly. Just take things easy until you are well worked into the exercise before you start to think in terms of limit attempts or heavy training poundages. If you feel the slightest soreness around the elbow put a hot pack on the joint and rub in some olive oil. A wash cloth soaked in hot water and wring out, or a small towel, will serve as the "pack." Rub in the oil well until it has been absorbed by the skin and little trace of it remains on the surface. You can warm the oil beforehand by setting the bottle in a pan of hot water. The lateral raise lying record in England is 121 pounds - two dumbbells weighing 60.5 pounds each. This is the heavyweight record. The most weight I have ever heard of lifted in this manner was by Bert Assirati. who performed TEN REPETITIONS with 150 pounds - two dumbbells weighing 75 pounds each - in strict accord with the rules. Another incredible feat of pectoral strength performed by Assirati was witnessed by me in the old Ring Gymnasium. Bert lay on the floor, stretched out his arms and, gripping two 56 pound block weights by their bases, made a lateral raise with them with consummate ease. 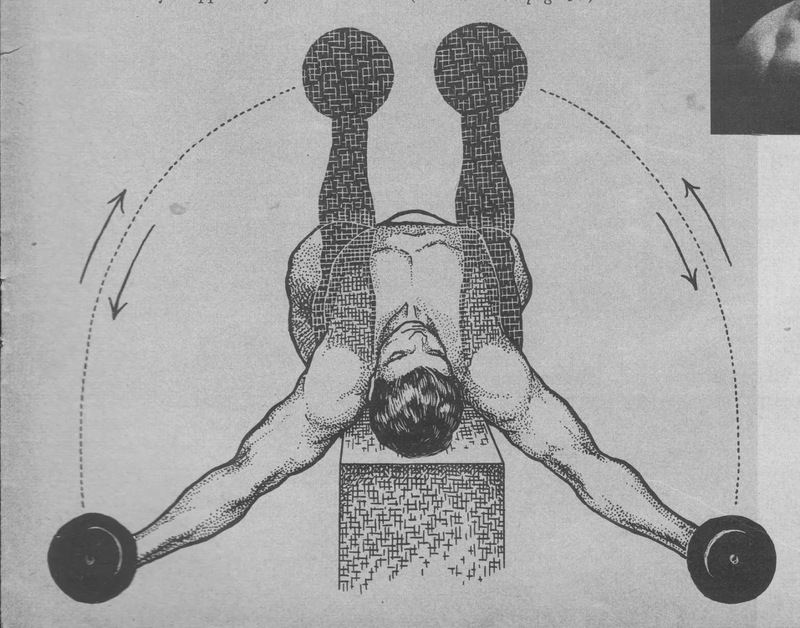 Lying on the ground with the arms extended level with the shoulders (palms uppermost), the dumbbells shall be raised until they are immediately over the lifter's face. Throughout the lift the buttocks shall remain remain on the ground and the arms and legs straight. In the performance of this lift, the use of ring weights is not permitted. Dumbbells only. Although a count is not insisted on at the commencement of this lift, a pause must be observed and the lift must not be continued from the momentum gained by lifting the dumbbell into commencing position. So much for the rules. Here are the assistance exercises for maximum power and development in the pectoral muscles. I would advise the use of the schedule for a period of at least three to four weeks. At the end of that time, try yourself out on the lift and determine what you are capable of. Then for another week after you limit attempt, train exclusively on the lift alone, then go back to the schedule. 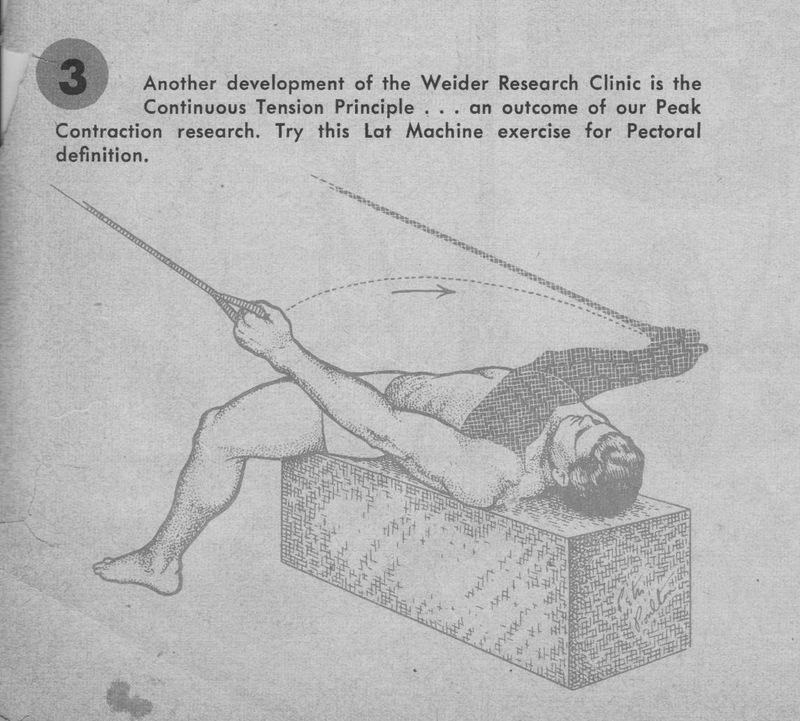 One of the greatest and best features of the Weider Research Clinic bulletins is the Cheating Exercise program. It has long been recognized by physical culture authorities that only by handling progressively heavier poundages can the muscles be brought to a peak of power and perfection. This is obvious. But of late, the Rebounding Technique has replaced certain cheating movements. Here is one of them. Take up the commencing position for the lift and press two dumbbells above the head. From this position lower them out and down to the floor, speeding up and bouncing them off the ground and over head again. It is best to have a rubber mat where each dumbbell strikes. DON'T KEEP THE ARMS STRAIGHT IN THIS EXERCISE, but have them slightly bent at the elbows. Start off with a poundage you can easily handle for 3 sets of 8 reps, working up to 3 sets of 15 reps.
Weider publications have always stressed that the ideal schedule was composed of exercises that utilized not only cheating methods but also the strict form of exercises. Not only can you gain bulk and tendon strength, but also separation and contractile power. Here is an exercise bench movement. Lie on the bench at full length. DON'T rest the feet on the ground. Take a dumbbell in each hand and lower them as far down as possible, keeping the elbows locked. From this position return to above the chest and repeat. There will be considerable stretch on the pectorals and no little stiffness next day. Start off with 3 sets of 10 reps working up to 3 sets of 15 before increasing exercise poundage. The latissimus machine is a grand piece of apparatus and no gym is really complete without it. In most dumbbell and barbell pectoral exercises, the tension the weight supplies . . . the resistance . . . lessens when a certain position in the exercise is reached. By using the lat machine for pectoral work, it is possible to keep contraction on the muscle from start to finish of the movement. Illustration 3 shows you how to do this movement. Lie sideways to the machine and have the cable coming down at an angle. The weight should be OFF the ground from start to finish of the movement. Grasp the handle and pull the arm up and over across the chest as far as you can. Hold the contraction for a count of three, then lower the weight and repeat. 2 sets of 15 reps, working up to 2 x 20 before you increase the weight will be fine. Quite a few bodybuilders complain of sprains in that section of the pectoral where it joins the deltoid. Here is an exercise to strengthen that area . . . none other than the wide grip bench press . . . but with a subtle difference. Lie on an exercise bench and take as wide a grip as possible on the bar . . . right out to the collars. Now, DON'T hold the weight overhead, let it down to the chest and press it up again with no pause. Do it this way. Rest the weight on the chest in the stretched position and press it from there. When you lower the weight, do so as slowly as you can and when it reached the chest, relax, allowing the barbell to rest across the upper rib box. Take a count of three between each rep before you press it overhead again. Start off with 3 sets of 8 reps and work up to 3 x 15 before increasing the poundage. Here is the final and toughest exercise in this Lateral Raise Lying Routine. Again it is one of those unusual movements. I call it 'rolling dips.' Take a pair of dumbbells and loosen the collars on the plates so they revolve FREELY around the dumbbell bar. Grip them as shown in the illustration while in the indicated position. Your feet are resting on the ground, so are the dumbbells. The hands grasp the bells and the arms are straight. The body and legs are also in a straight line. From this position push the dumbbells out and away from the body, lowering the trunk. Don't try to lower the trunk too far at first. Just push the dumbbells out three or four inches, then pull them together again, raising the trunk. Gradually work lower and lower until the chest nearly touches the floor. Start off the exercise with 2 sets of rolling dips, making as many repetitions as possible. Increase by one set each two weeks until you are performing four sets. Then you can attach a weight to you waist or back for increased resistance.